In an effort to improve our Mario Kart skills, we decided to hit the tracks for real. My favourite part was when I threw a blue shell at Stuart and knocked him out of first place (only joking, no violence involved). Despite the significant lack of in-race weaponry, fun was had by all. 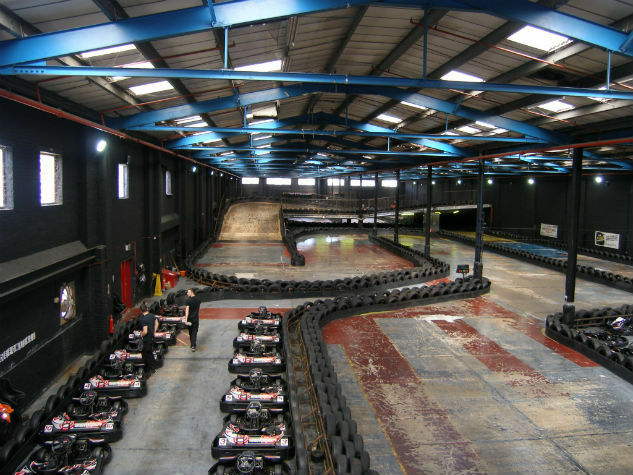 We went to TeamSport in Lancing, a multi level indoor track with a flyover and banked corner. The staff were friendly and informative, and after a Top Gear style briefing in the form of a dramatic video, we were ready to go. The main thing to takeaway from the video was that if you're naughty, you get a dreaded black flag. This deducts points, and if repeated can mean you get retrained or kicked off the race. We started off with a qualifying race, 15 minutes around the track. I was lagging behind, enjoying my leisurely drive (because you know, slow and steady wins the race), whilst the guys zoomed ahead. Andy was driving like a maniac and therefore was issued with a black flag. Coincidentally, in a fit of rage at my loss* at the end of the race, I crashed into the back of Andy and got shouted at (*actually accidentally pressed accelerate instead of brake, oops). Luckily for Stuart, Mario Kart skills must equate to real karting skills. He got fastest lap in qualifying race, with Greg being fastest overall. We had a short break, some refreshments, and watched other racers from the sidelines. A youngster got so many black flags he was forced to be retrained by the marshall. Tut tut. Kids these days, eh. Onto the main race, also 15 minutes long. Well-practiced from the qualifying race, I didn't crash quite so much and wasn't in last place for the whole time (although the majority of it). Competitive juices flowing, it was a close call in this race. A crash involving Dan and Greg booted Stuart into first place, and Dan and I had a dramatic showdown on the bridge (basically he just overtook me). Overall a fun-filled day. I'm working on my Mario skills in the hopes that I'll do better next time. But it's not all about winning, it's participating that counts. Although it is a little bit about winning. Well done Stuart!